The Bosch GTS1031 10-Inch Portable Jobsite Table Saw is a pretty good choice for those in need of a compact and easy to carry saw. I find the complete on-tool storage a nice addition and the overall performance pretty true to the Bosch hype. That being said, considering the vast amount of information I’ve been bombarded with in relation with this particular piece, I’ve taken the liberty to thoroughly research and review it. I hope that all the information I’ve gathered will help shed some more light on the Bosch GTS1031 10-Inch Portable Jobsite Table Saw. Is it good? Is it bad? Is it in between? Though I wouldn’t necessarily call myself a ‘professional’, I’ve been around my fair share of tools. 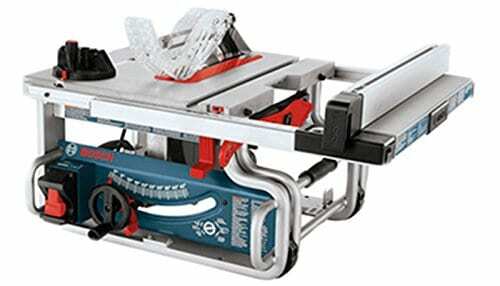 The Bosch GTS1031 10-Inch Portable Jobsite Table Saw is a fairly light, compact saw. If you have a bulkier physique, you will have no problem carrying it with just one hand. I do not find that this Bosch model disappoints. Of course, if you are quite partial to a larger, heavy-duty saw you might need to look elsewhere. But I do find that this compact and portable unit is quite easy to use. Though Bosch GTS1031 10-Inch Portable Jobsite Table Saw is marketed as a portable, compact and easy to use saw, some of the heavier users will probably find some issues with it. I have to say I like it and would recommend it even if mostly to the occasional user. I mean, it does its job pretty admirably, wobble or no wobble. More professional users will also like this unit, especially if they already own the monstrous, heavy-duty models and are looking for something a bit lighter and more compact. Table saws are a necessity for many shops and jobsites. While people might comment on what an easy concept it is to make one such unit, the reality is different. Yes, you basically put a high-performance motor under a solid bench/ table and turn a blade some rotations/ minute. Yes…sawdust will indeed fly. But…is this it? What’s the best blade size? How large should the actual workspace surface be? Is a portable, lightweight model better? If not, can you actually carry the damn thing to any jobsite? I had the same questions roaming through my mind for quite a while before I actually started to look in the matter of what makes a good table saw. However, most portable saw models nowadays come equipped with anti-kickback pawls, riveting knives and a split blade guard. If you like one that doesn’t have these, mainly because of the price, don’t buy it. Every single manufacturer has a special approach on adjusting features. It is bet to look for a saw with metal gearing under the table. Plastic parts will tear off easily. This part works at grasping and keeping hold of the table edge. The best saw models on the market have at least 3 points of contact. As a rule, when you set the saw, slide it into position so that it slides parallel to the table surface. An off square fence will lead to work inaccuracy. Here, the weight of the actual saw plays an important role. Sure, you mostly want a good, high-performance saw, but it’s also important to consider portability. Luckily for you there are quite a few high-performance yet light models on the market, much like the Bosch GTS1031 10-Inch Portable Jobsite Table Saw. Here you have two aspects to consider, namely, the actual cutting power and the dust collection mechanism. No matter if you are a professional or the occasional DIY type, one thing is sure – you want to make deep, accurate cuts, so the power factor is a no-brainer. However, dust collection is not that necessary as many contractors will tell you. But, if you are mostly working inside, remodeling, DYI, you name it, it will soon become an important thing to you. This saw model is a compact, fairly easy to carry unit. At only about 52 pounds you will be able to take it to your preferred worksite using just one hand. Being consistent with the overall high-quality Bosch has accustomed us with, the steel GTS1031 manages to incorporate a lot of perks in its tiny frame. Do not let this small fellow fool you. While affordable and very compact, the high-performance material it’s made of ensures a high-degree of durability. And due to its powerful motor (15 amp), this unit will be able to tackle even harder wood varieties. Most people will actually be pretty surprised at the motor power, especially considering the actual size of the machine. No need to worry though as this Bosch model will even be able to tackle the hardest of wood varieties. This ensures an increase in portability as does the very compact design of the actual saw. The high-quality steel used in the construction will take any jobsite abuse. And considering this piece is part of the heavy-duty tool variety, it will surely be submitted to its fair share of on-site ‘banging’. No need to worry though as this machine will be able to handle anything short of an explosion. The under the table storage for much-needed tools is a nice addition, especially considering the compact design and actual size of the Bosch GTS1031 10-Inch Portable Jobsite Table Saw. If, normally, tools end up all over your shop, this storage will remind you to safely put them away. From wrenches to the rip fences and anything in between, the storage space will handle anything. As do most top-notch models, this one also includes some high-quality safety features. In this case, they are modular, allowing you to safely detach or attach them as pleased. The riving knife will also prevent any potential kickback as do the anti-kickback pawls. Any wood fabrication process entails a lot of chips and dust. Though not coming with a vacuum, the dust-collection part of this Bosch saw will safely attach to one you already have in the shop. Though I was inclined to buy this Bosch saw unit, for the purpose of this review as well as my peace of mind, I decided to scour the internet for any additional information. Not surprisingly I came across countless reviews – some great, some bad and some in between. So…let’s start with the good ones. Most people who have actually used this unit claimed they bought it mainly because of the hype surrounding Bosch. This is understandable, considering I was about to make the same choice. That being said, they were pleased with the saw’s performance as well as its high-quality construction. Another feature that was deeply praised was the dust collector and many claimed that it managed to do its job admirably, catching about 85-95% of dust particles (opinions vary). The powerful motor came as a surprise to many, considering the lightweight and compactness of the machine. The Bosch GTS1031 10-Inch Portable Jobsite Table Saw is a pretty good model considering its size and compact design. I do like it and am still inclined to purchase it even after reading hundreds of reviews. This is also a good option for all those job-site table saw aficionados. This 22 kg unit has a steel roll cage that increases its durability, and an extremely powerful 1850 watts motor. Its fence system will provide up to 610 mm rip capacity and its cast table, complete with front and rear fences, design will ensure your work will be accurate and precise. Also quite portable and easy to use, this model from Dewalt takes pride in the high-quality of its design and its tool-free, quick adjustments. This portable saw model from Delta Power comes complete with an aluminum table top and RH table extensions for a better grip on the work piece. What is a nice addition is the fact that the actual blade is able to retract below the table top, ensuring an easy clean-up process. A bit on the heavier side, coming up at 87.8 pounds, this portable saw can handle anything you throw at it. This might have something to do with the high-quality, 10-inch Delta saw blade. This third option comes from Ridgid and has an incorporated high-quality fence. Lightweight, very powerful, at least when compared to other portable models, this saw is able to handle most things you throw its way. As opposed to other saw varieties, this one does allow room for a dado throat plate, albeit one you have to purchase separately. This Hitachi portable saw comes with a powerful, 15 amp motor, able to produce up to 4,500 RPM. A nice feature that sets it apart from other portable saws is the telescopic table extension. This extension will support up to 22’’ of ripping capacity to the left and 35’’ to the right. Much like the Bosch GTS1031, this machine also offers the perk of an on-site storage. Those concerned about this should know that the 13/16’’ dado capacity does allow for dado cuts, albeit simple one. As I’ve previously told you, I am by no means a professional carpenter or contractor, though I do take pride in my knowledge of toys. For my purposes, mainly DIY stuff, the Bosch GTS1031 10-Inch Portable Jobsite Table Saw works beautifully. Though a bit on the fence after reading so many reviews on the topic, I have to say that I was pleasantly surprised by the quality and performance of this particular saw. The motor is quite powerful for such a compact unit, the alignment and setup are fairly easy and the cuts are precise. As most users did, I too appreciate the built-in storage area – I am a bit messy by nature – as well as the relative cleanliness provided by the GTS1031 dust port. That being said, as a negative aspect, the adjustment parts are plastic and they will tear off with use. There is much room for improvement here. Overall, this is quite a nice little purchase and I recommend you at least check this saw out.